The Farming Minister, George Eustice, has visited Coverdale in the Yorkshire Dales to see the trial of a new style of agri-environment scheme. Mr Eustice met William Utley of Bridge End Farm in West Scrafton, as well as Yorkshire Dales National Park Authority (YDNPA) officers, Adrian Shepherd and Helen Keep. The officers were representing the Northern Upland Chain Local Nature Partnership (LNP). Mr Utley is receiving payments for producing good quality habitat for breeding waders such as curlew, snipe, lapwing and redshank. Unlike other agri-environment schemes, he has no land management prescriptions to follow, but can farm as he sees fit in order to achieve positive environmental outcomes. 19 farms in the Wensleydale catchment area are taking part in the three-year Results Based Agri-environment Payment Scheme. It is one of only two pilots in the UK, in a project being co-ordinated and managed by Natural England. Mr Eustice, who also met members of the recently established Northern Hill Farming Panel, described the northern uplands as precious. He noted the importance of cutting red tape and of having simple agri-environment schemes. He also discussed how in the future, schemes could be designed to fit the locality, rather than a one-size-fits-all national approach. 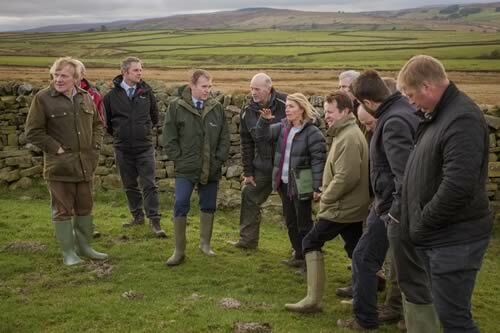 “The Northern Upland Chain Local Nature Partnership was delighted to welcome George Eustice to the Yorkshire Dales. We gave him information that our farmers and the Northern Upland Chain LNP hope will help him develop post-Brexit legislation and funding for the uplands. “The project recognises and builds on the expertise of farmers and land managers, puts trust at the heart of the relationship, and rewards outcomes and results for conservation. The pilot is one of a number of options we are exploring to help ensure England’s nature and landscapes are protected for wildlife and people to enjoy for generations”.